"You've got to be crazy to like Cut to the Chase--crazy about thwacking bass lines! There's no denying that Mark Manley is an extraordinary bass player--one look at the video the band sent us confirms that... The material is thoughtfully written. Often, as on 'I Wish', it recalls the early political manifestos of Was (Not Was)... Worth seeing live for the four-string gymnastics, certainly." Mark Manley and Michael Lummio, last official CTTC gig. The venue was Hollywood Alley. Mark and Mike, same gig, same venue. Last un-official Cut To The Chase gig, at The Congo. From left to right, Mark Manley, Rob Müller, Mike Lummio. 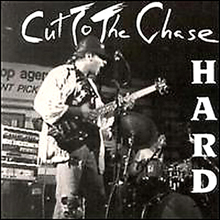 These are songs from the first CTTC album, eponymously titled "Cut To The Chase". I met James through bassist Dexter Simms at Chicago's Cotton Club. He was rockin' the house with a latin jazz pianist, whose name escapes me right now. My attention was on James, who was funky as anyone has a right to be on a double-kick kit. He was fantastic. And as it sometimes happens, we found ourselves in need of a great drummer not too long after.... Our regular drummer had a commitment he could not get out from under, and we found ourselves needing someone for the next morning. Too late to call that evening (try 2:30 AM), I called James at home about 7:30 AM (I know, too early.) He agreed to come down to the studio, and listened to the material while he was setting up. He began to play along while the engineer began getting levels on his kit. Not only did James nail his parts on the first take of every tune, on one of the songs we even kept his warm-up as he began playing along just after he had gotten his kit situated.... What an amazing drummer.